N 12° 35' 30" and E 43° 12' 0"
Moulhoulé in Obock is a town located in Djibouti about 69 mi (or 112 km) north of Djibouti, the country's capital place. Time in Moulhoulé is now 08:21 PM (Friday). The local timezone is named Africa / Djibouti with an UTC offset of 3 hours. We know of 8 airports nearby Moulhoulé. The closest airport in Djibouti is Obock Airport in a distance of 43 mi (or 70 km), South. Besides the airports, there are other travel options available (check left side). There is one Unesco world heritage site nearby. The closest heritage site is Historic Town of Zabid in Yemen at a distance of 111 mi (or 179 km). Being here already, you might want to pay a visit to some of the following locations: Dhubab, Assab, Obock, Mawza` and Ash Shuqayrah. To further explore this place, just scroll down and browse the available info. Let's start with some photos from the area. The Bab-el-Mandeb (variously transliterated Mandab or Mandib, and with article "el-" given also as "al-", with or without connecting dashes) meaning "Gate of Grief" in Arabic (باب المندب), is a strait located between Yemen on the Arabian Peninsula, Djibouti and Eritrea, north of Somalia, in the Horn of Africa, and connecting the Red Sea to the Gulf of Aden. It is sometimes called the Mandab Strait in the English language. Located at 12.5833, 43.3333 (Lat. / Lng. ), about 9 miles away. Ras Siyyan or Ras Siyan is a peninsula in the Obock Region of Djibouti, on the Bab-el-Mandeb strait, about 20 km southwest of Perim Island. The peninsula consists of a reddish volcanic hill about 1.2 by 0.5 km and 138 m high, connected towards to the mainland by a low sandy strip that stretches south by about 5 km while widening from 500 to 800 m. The Ras Siyyan volcano is currently inactive but young, having erupted through a 21,000 year old coral reef formation. Located at 12.4753, 43.3217 (Lat. / Lng. ), about 11 miles away. Herkale Airport is an airport in the town of Herkale, Djibouti. It is situated near Fagal. Located at 12.4333, 43.3 (Lat. / Lng. ), about 13 miles away. The Djiboutian–Eritrean border conflict between the forces of Djibouti and Eritrea occurred between June 10 and June 13, 2008. It was triggered by tension which began on April 16, 2008 when Djibouti reported that Eritrean armed forces had penetrated into Djiboutian territory and dug trenches on both sides of the border. The crisis deepened when armed clashes broke out between the two armed forces in the border area on June 10, 2008. Located at 12.7083, 43.1333 (Lat. / Lng. ), about 9 miles away. Siyyan Himar or Rocher Moulhele is a pair of small islands, about 100 m apart and rising only 1.8 m above sea level, located about 3.8 km off the coast of Djibouti and 4.4 km northeast of the Siyyan peninsula, in the Bab-el-Mandeb strait. They are an uplifted ridge of a fossil coral reef. Located at 12.5183, 43.2986 (Lat. / Lng. ), about 8 miles away. Rocher Siyyan is a striking isolated white islet in the middle of the marshy bay to the west of Ras Siyyan peninsula, off the coast of Djibouti, in the Bab-el-Mandeb strait. 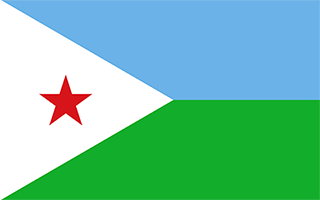 It belongs to the Obock District of Djibouti. The rock lies about 800 m southwest from the volcanic hill that is the norther tip of Ras Siyyan, and about 1500 m from the mainland's shoreline. Located at 12.4696, 43.3083 (Lat. / Lng. ), about 11 miles away. These are some bigger and more relevant cities in the wider vivinity of Moulhoulé.